The newly-published Nouvelle Compression Wear Guide offers comprehensive guidelines regarding proper use, fabric content, and specific cosmetic surgical procedures for which compression wear provides a healing advantage. We address concerns such as how compression garments can help reduce swelling, decrease the risk of blood clots, and help assist the body in flushing out harmful fluids during recovery. -Dawn Cover, president, Nouvelle Inc.
Nouvelle, Inc. is pleased to offer a comprehensive guide to successful use of compression wear products following surgical procedures such as tummy tucks, liposuction, arm lifts, breast augmentation and more. The Nouvelle Compression Wear Guide focuses on a variety of questions regarding the company’s products, and provides specifics for consumers regarding proper use, fabric content, and surgical procedures for which proper compression wear provides a healing advantage. “We address concerns such as how compression garments can help reduce swelling, decrease the risk of blood clots, and help assist the body in flushing out harmful fluids during recovery,” notes Dawn Cover, president of Nouvelle Inc.
1. What are compression garments? 2. What are the medical benefits of compression garments? 3. 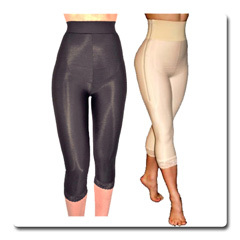 How can compression wear help my body heal faster following cosmetic surgery? 4. How do I launder my garments? 5. How should I protect the surgical site while my garments are in the wash? 6. I have not had plastic surgery, but recently read that compression garments can help improve my appearance. Is this true? 7. What are the different types of compression garments? 8. What is the fabric content of compression garments manufactured by Nouvelle?